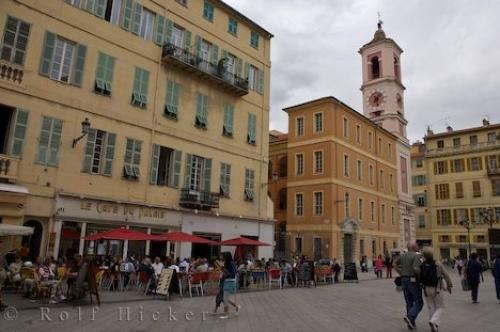 A typical cafe and street scene in Place du Palais where tourists love to explore in the Old Town of Nice, a City in the Cote d'Azur in Provence, France. Photo of the Place du Palais, a common area for tourists while visiting the Old Town of Nice in Provence, France in Europe. ... There are numerous accommodations available near Place du Palais in the Old Town of Nice, which makes it easy for tourists to walk to these well known places. There are other famous landmarks a short distance from the square and walking gives you a true feeling of the atmosphere which surrounds the Old Town of Nice.Holidaying in the Old Town of Nice in Provence, France is one of the best vacations anyone could ask for, but there is so much to see and do, especially if you are on the clock. Being a tourist can sometimes burn people out and taking some time at a street cafe in Place du Palais, brings everything back into perspective.Street cafe in Place du Palais in Old Town Nice, Provence, Cote d'Azur, France, Europe. I photographed this photo with the digital SLR camera model Canon EOS-1Ds Mark II, aperture of f/9.0, exposure time of 1/320 sec. on ISO 100, as always I used a original Canon Lens, the focus lenght for this picture was 24mm.